Add warmth of candlelight to your home, garden or patio. 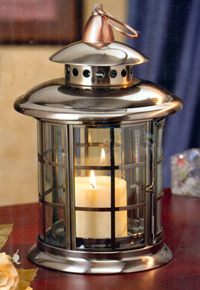 This high quality antique style Lantern & Stand, manufactured using high quality materials Include brass, finished in a two tone pewter and copper, lacquered finish for extra durability for outside use, The Lantern is fitted with Bevelled Glass, with window for easy access. Lantern can also be used on a table top. Candle not supplied.